This entry was posted in Alumni, Community and tagged trustees on August 22, 2014 by Wire Eagle. James W. “Jimmy” Rane, chairman, president and CEO of Great Southern Wood Holdings, Inc., was named “Citizen of the Year” by the Alabama Broadcasters Association earlier this week. The award was presented at a luncheon during the group’s annual conference with hundreds of broadcasters from across the state in attendance. This award recognizes contributions to education, business, professional, civic or philanthropic efforts that have benefited Alabama citizens. Rane is an Auburn University alumnus and serves as President Pro Tempore of the Board of Trustees. This entry was posted in Campus Announcement, General News and tagged trustees on February 14, 2013 by Wire Eagle. AUBURN UNIVERSITY – The Alabama State Senate Thursday approved two new members of the Auburn University Board of Trustees. Mike DeMaioribus, senior vice president at technology company Dynetics in Huntsville, will represent District 8, which stretches across north Alabama. Wayne Smith from Nashville was selected for an at-large position. Smith is chairman and chief executive officer of Community Health Systems, an operator of acute care hospitals in 29 states. This entry was posted in Campus Announcement, General News and tagged trustees on January 31, 2013 by Wire Eagle. The Auburn University Trustee Selection Committee on Thursday appointed Mike DeMaioribus and Wayne Smith for vacant positions on the AU Board of Trustees. DeMaioribus was selected to fill the District 8 position, while Smith was chosen for the At-Large position. The governor is forwarding the appointments to the Alabama Senate for confirmation. This entry was posted in Campus Announcement, General News and tagged trustees on May 27, 2011 by Wire Eagle. 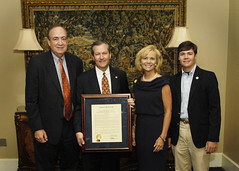 AUBURN – Gov. Robert Bentley has announced that the Auburn University Trustee Selection Committee is reopening the nomination period for vacancies on the Auburn Board. Bentley said that nomination letters, resumes and any letters of support should be submitted by 4:45 p.m. on Friday, June 24, and that all nomination information should be submitted electronically to the following link: www.auburn.edu/trusteenominees2011. The link for the Board of Trustees application will be available online at 7:45 a.m., May 31. The Auburn Board of Trustees currently has nine vacancies: Districts 1, 2, 3-Lee County, 3, 4, 6, 7, 9 and one at-large position. This entry was posted in Campus Announcement, General News and tagged trustees on April 18, 2011 by Wire Eagle. AUBURN – Governor Robert Bentley thanked the nearly 200 individuals nominated for consideration for the nine positions either currently open or soon to be vacant on the Auburn University Board of Trustees. “We’re fortunate that so many highly-qualified men and women in the Auburn family are eager to serve,” said Bentley, who is president of the university’s governing body.